If you have something to hide, we have got the perfect solution for you! 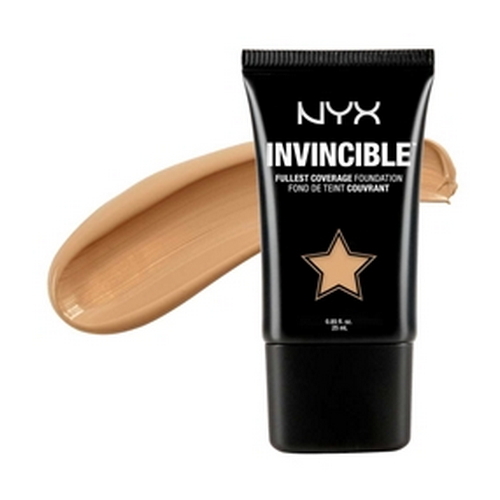 NYX Invincible Fullest Coverage Foundation offers exceptional coverage with a long-lasting, natural-looking finish. The incredibly high-pigment load has the super powers to conquer even the most challenging coverups including skin discolorations and more. The finished look is soft, matte, beautiful and flawless. >What it is: A highly-pigmented foundation for full coverage with a matte finish. >What it does: Evens skin tone appearance. >Why we love it: This full-coverage formula is incredibly light and comfortable to wear. >How to use: Apply to face or body over primer using fingers, makeup sponge or brush to maximize coverage. Set with powder.